Thermo-Sleeve by Thermo-Tec is the perfect solution for your delicate wires and hoses, protecting them in even the most extreme of conditions. Thermo-Sleeve is also fireproof and oil resistant. Theermo-Sleeve is constructed via a seamless lamination of a high-temperature fabric to a highly-reflective foil outer casing. 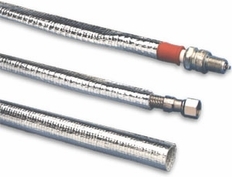 This highly durable design provides protection from radiant heat for hoses and wires in almost any application you can imagine. Over 90% of radiant heat is reflected when using Thermo-Sleeving. For 5/8 to 1 inch diameters. 12 feet length, which is trimmable.